This was a four day workshop at The Wellside in Tottenham Green funded by FreeSport. Participants worked with a hula hoop artist and a circus artist to create a Cheerleaders “Cheer” using hula hooping and acrobalance that was then performed to friends, family and the wider community. This project also included two days of activities for young people with learning disabilities from Centre 404 in Islington. JL Youth participants take part on Blue Peter with presenter Radzi. They all got Blue Peter badges! Participants explored a wide range of skills working with a hula hoop artist, a clown, a dance specialist and a drama specialist. They worked together to create an indoor and outdoor circus spectacle that was performed to friends and family at the end of this three day workshop at Triangle Children, Young People and Community Centre. Participants worked with writer and performer Rebecca Crookshank who shared material from her show Whiskey Tango Foxtrot before she flew off to the Edinburgh Festival. The play is a solo show, based on Rebecca’s time in the Royal Air Force. This workshop explored ideas about pioneering women, aspirations and identity. It was a great opportunity to meet new people, share experiences and learn to write about character and story from scratch. The students experimented with text from the play and developed their own writing. Throughout spring term, JL Circus participants worked with three different specialist artists to create #ASPIRATIONS - a new performance exploring drive, aspirations and what keeps us moving forward in life, which was presented on Jacksons Lane’s stage in March. See photos and video. JL Youth Board members represented JL Circus at this year’s National Youth Circus Event. Over the weekend event, participants developed specialist circus skills with top professionals including Gandini Juggling and Mimbre, and attended Cirque du Soleil’s Kooza at the Royal Albert Hall. The event concluded with a tea-party cabaret featuring youth circus acts from across the UK. See photos here. Building on the success from last year, this year’s Haringey Arts Festival was bigger and even more ambitious! JL Circus participants showcased their juggling, acrobalance, and hula-hooping skills in a high-energy performance at the Haringey Sixth Form Centre. See photos here. Working with a street performer and circus artist, JL Circus participants created an outdoor circus spectacle, which was performed on Tottenham Green and Markfield Park to promote the JL Circus programme and Haringey Council’s Imagine If platform. 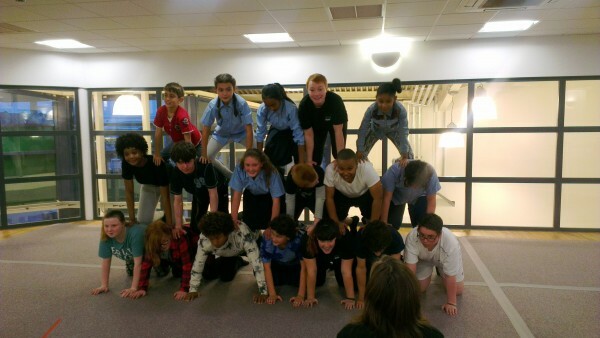 This project was initiated by the JL Youth Board with funding from Haringey Council. See photos here. Participants worked with professional artists from a range of disciplines to explore a new art form in intensive, day-long workshops. This year’s Summer Intensives explored Street Theatre with Joe Fleming, Artistic Director of Circadian Troupe and Digital Storytelling with Kerri McLean, Artistic Director of Rolemop Arts and artist in residence at Bernie Grant Art Centre. A Heritage Lottery Funded project with performance artist Kazoko Hohki and Year 9 St. Thomas More pupils who worked to discover the history of the Wood Green Empire and bring it back to life in its original location: now a Matalan store. Read more here. A selection of JL Circus participants attended National Youth Circus Event at the National Centre for Circus Arts to develop specialist circus skills, see a Barbican performance and meet circus peers from across the UK. JL Circus’ first performance on Jacksons Lane stage – PHASES featured a cast of approximately 40 ‘scientists’ combining circus and theatre skills to explore the moon. Check our images on our Facebook page. Our JL Circus participants performed in the first Festival showcasing the talents of young people form Haringey. Follow on Twitter. An intergenerational project with Age UK, Kori Arts, St Thomas More Secondary and Fortismere Secondary Schools. 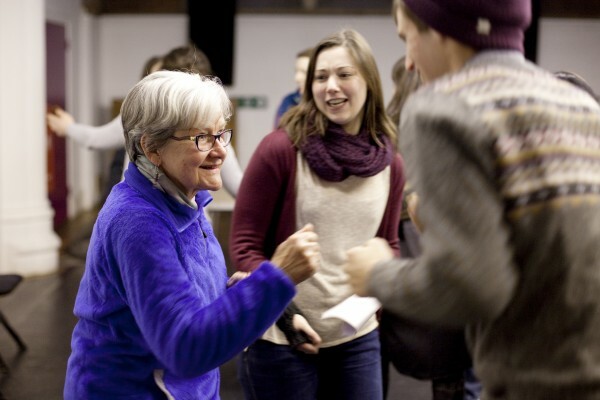 Young people were inspired by local older people they met, sharing food and stories. Read more here. University students delivered workshops and answered questions about higher education. The Challenge Network were based at Jacksons Lane over the summer 2013, this included a day of volunteering for our monthly Social Lunch and members of our staff team being members of their ‘Dragon’s Den’ panel!